Biofreeze is a rub on pain relief gel that many people and chiropractors use in the UK and around the world on sore areas of their body. I remember coming across Biofreeze gel on a Chiropractic conference in the USA back in the early 2000’s for the first time. I know how people who are looking for back pain relief will tend to use a pain relief gel or cream to rub on the painful area. Today I wanted to let you know more about Biofreeze pain relief gel which I have used on myself. 5 Where to Buy Biofreeze? 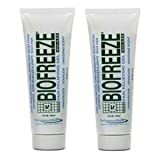 Biofreeze is a natural pain relieving rub that uses cold therapy for create pain relief. This means that when you put it on your skin you will feel a cold effect on the area of the skin where it was applied. This is different compared to other analgesic products you rub on your skin like a Deep Heat® or IcyHot®, which makes the area feel hot and warm. 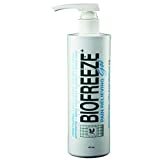 I remember when I first put Biofreeze on my lower back how cold it felt over my low back. The cold feeling is not a bad feeling as I know how helpful using cold therapy (cryotherapy) is as a pain-killer. It works similar to freezer cold packs or ice bags that will numb an area and reduce swelling for pain relief. I found the gel was easy to rub onto my lower back and got to work within 1-2 minutes. That numbing cold feeling lasted for me on my back for quite a few hours. What I found also that combining the Biofreeze gel with a cold pack over the lower back area for 20 minutes really made a sore back feel better. You can smell the menthol, which is the active ingredient in Biofreeze. Saying that though it doesn’t smell half as strong as Deep Heat does. You know when someone has put deep heat on their back. I see Biofreeze recommends that you only apply Biofreeze up to four times in a day. Also to do a skin sensitivity test like most creams or gels you would rub on your skin to make sure you don’t have an unknown skin reaction to menthol or one of the other ingredients. 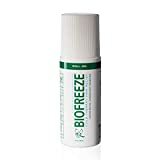 Biofreeze is a topical pain relief rub on gel that is mainly used for minor muscle strains, pulled muscles and aches. When you’re at your next osteopath, chiropractor or physiotherapist appointment you probably could buy some get some Biofreeze gel at their clinic. They probably use this therapists size bottle on you. The easiest way to get hold of some would be to buy it online through Amazon so it can be delivered to your door in the UK or USA. They do also have the greatest selection of different Biofreeze gel and bottle sizes sold directly to the public. In the US you can get the new Biofreeze singles to stick directly on like a plaster.